From light pulls and glass shelves, to robe hooks, wire soap baskets and pedal bins, it's all here in one place. 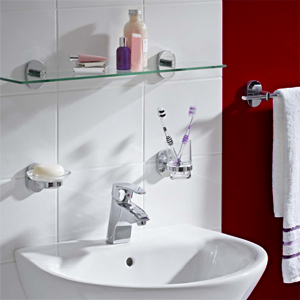 So improving your bathroom with new accessories is now easier than ever and we have all the products to help you. Our bathroom accessories are so incredibly easy to fit too and we even have "flexi fix" ones that allow you to use the same screw holes, so no drilling ! How easy is that ! Why not take a look at our new range of simplehuman pedal bins too, great quality at amazing internet only prices. Got a question ? Just call our accessory experts on 01527 522 522 and we will be happy to help and advise you.